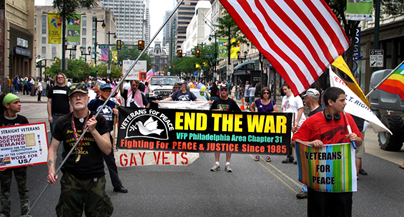 Veterans for Peace (VFP) is a national organization founded in 1985 comprised of members across the country. VFP members includes men and women veterans of all eras spanning the Spanish Civil War (1936-39), World War II, the Korean, Vietnam, Gulf and current Iraq wars as well as other conflicts. 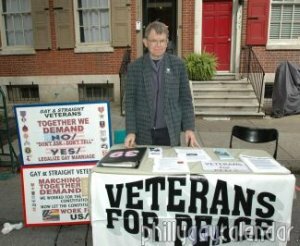 As Veterans for Peace we draw on our personal experiences and perspectives gained as veterans to raise public awareness of the true costs and consequences of militarism and war - and to seek peaceful, effective alternatives. Our collective experience tells us wars are easy to start and hard to stop and that those hurt are often the innocent. 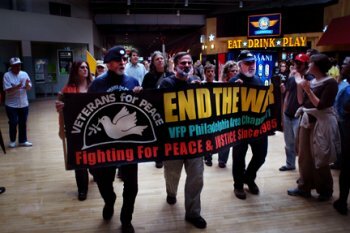 Philadelphia VFP members are working to stop the wars in Iraq and Afghanistan, show youth alternatives to militarism and violence, stopping the global plague of landmines & clusterbombs, and ending the horror of gun violence. "The veterans provided a perspective we don't hear often. It helped me understand that Veterans aren't necessarily supporters of war." "It was interesting to hear their perspectives because they are not views we often get." "The visit allowed students to ask questions and get real answers." 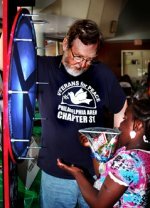 CHAPTER 31 MEMBER JOHN GRANT DEMONSTRATING THE PEACE WHEEL AT THE PHYSICIANS FOR SOCIAL RESPONSIBILITY CELEBRATION OF YOUTH.